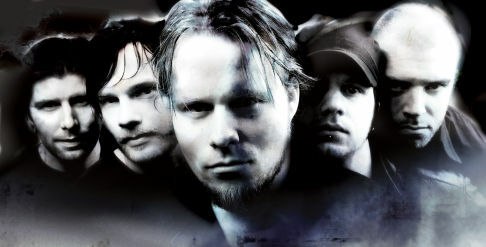 Machinae Supremacy is a Swedish metal band. EP talked to Robert, the singer of the band. When was your first encounter with video games music? As a child, probably with the C64. There were hardly any sound fx then, mostly music going on and on in the background. I was probably to young to appreciate it back then, but now as I look back at it, I realize what impact it must have had. How do you come to make the music for the Jets'n'Guns shoot-them-up game? The developers of the game, Rake in Grass, asked us to do it, and since the game looked awesome we accepted. And we're glad we did. It was really cool to be involved in the making of that game. Your music style is quite original, and is a mix of various styles, how did you get this idea? It wasn't as much an idea as something that happened more or less on its own. We wanted to start a band, and we were playing around with a lot of electronic stuff at the moment even though metal and rock music came more natural to us. The result was that many elements we wouldn't have normally have included in a band like this became part of our song writing process. How do you compose then play this kind of music in concert? We use a lot of computers when we make our music, apart from the obvious "garage band" elements, but most of our recording and live gear is very low-tech. We've always just tried to get a good result with what we've had available, and so we've gotten used to doing things this way. What is the gist and origin of the name Machinae Supremacy? Me and Kahl were very into cyberpunk and dark future ideas back when we formed the band, and the name is meant to signify the machines' superiority over man. Each member of Machinae Supremacy has a great history in music, please give us a brief sum up of them. 'Great' is too strong a word, I think. We've all been playing music long before we started the band. Poe has been singing in playing guitar in a band called Slideshow for a long time, and I used to play with Tomas in a skate punk band called Garden of Concrete back in the day. I also played drums in Pöbeln, a punk band. Tomas has played in bands like Shinedust, Far Apart and The Horsemen. Jonne and Gordon weren't in any bands worth mentioning, but they've both been playing and making music since youth. Robert, you're the singer of Machinae Supremacy, please give us a hint about what this involves for you and your voice with such a typical music style. My voice is kinda whiny and strange, I know. Some people have a real problem with this, but I think it's great. It's another aspect that makes us unique. When we started the band I'd decided that I wanted to be the singer, even though I didn't really know if I'd be up to the challenge, but now as I've been doing it for a few years I think it's working out great. Why did Tobbe and then leave the band? They both moved to the south of Sweden, too far away to remain active members of the band. You're a DIY (Do It Yourself) metal music band. How good is it to be independent and being like a music's artisan in this highly industrialised activity? Well, we're not as independent now as we once were, but at least we still enjoy total creative freedom. If you know how to get things done yourself, I'd definitely recommend doing things yourself. The sad part is that it's hard to get taken seriously by promoters and festivals and the like if you do not have a record label or a booking agency. People don't tend to trust something that someone else hasn't invested money in. My hope is that this mentality, however, is a thing of the past that will slowly fade away now that it's much easier for people to achieve professional results on their own. I believe the future of the music industry will be much more free and open, with a lot more DIY. DIY is respect. A few mp3 are freely downloadable at http://www.machinaesupremacy.com/webography.html. Which one will you play at your next gigs? Probably Kings of The Scene, Attack Music and Masquerade. What computers / consoles have you used in the past and present? Which change in this area for the future? I personally went through a C64, NES, Amiga, PS2, Xbox and a GameCube, besides PC of course. In 2006 I got a Nintendo DS and a Nintendo Wii, both of which I enjoy a lot. I think this last generation of consoles shows what we can expect in the future. Some systems will always go for power and speed, and others might just aim for innovation instead. What software and special techniques are you using to create your so artistically special music? We use a lot of free software (not open source, but free) when creating music, and we try to think in a certain way to get the most out of melodies and other ideas. If you try to create the basic song idea with as simple and as few elements as possible, you're more likely to end up with a good song, than if you think in terms of production and additional arrangement first. You've created a new type of music style, how proud are you about it? Very. We love that people find our music so unique. I say being like everyone else isn't very rewarding, so if you get a chance to be different, be different, and be proud of it. Haha, they're awesome, obviously! And with the merch we're putting out now, they're gonna look even hawter! Have you heard of Symphony X / Rondo Veneziano and do you like their musics (SX does arrangements with symphonic classical music and hardrock, while RV does arrangements with classical music and synthe + drums)? The first one rings a bell, but sorry, never heard of the second one. I do enjoy bands like After Forever and Nightwish, who use orchestral a lot in their music.